William Henry Watson was born 1821 in Upper Canada, and died August 3, 1899, in Grand Blanc, Genesee Co., MI, at about age 78. Buried in South Grand Blanc Cemetery (a/k/a Halsey Cemetery), Grand Blanc, Genesee Co., MI. He is the son of Unknown. Mary Searle was born about July 27, 1823, in County Cornwall, England, was Christened August 2, 1823, in Broadoak (Braddock) Parish, County Cornwall, England, and died August 26, 1888, in Grand Blanc, Genesee Co., MI, at age 65. Buried in South Grand Blanc Cemetery (a/k/a Halsey Cemetery), Grand Blanc, Genesee Co., MI. She is the daughter of William Husband Searle of Tywardreath, County Cornwall, England, and Anna Hill of England. William Searle and his family came from Cornwall, England, to the Cobourg-Port Hope area in the early 1830s with many other Bible Christians who came from Cornwall at that time. William Henry Watson and Mary Searle were married October 24, 1846, in Hope Twp., Durham Co., Canada West. Franklin Henry Elias Watson: Born March 18, 1848, in Clarke Twp., Durham Co., Ontario, Canada West; Died November 23, 1924, in Ontario, Canada (age 76). Married September 27, 1871, in Port Hope, Northumberland and Durham Co., Ontario, Canada, to Electa Lorinda "Lecta" (Clarke) Delong: Born July 13, 1843, in Darlington Twp., Durham and Northumberland Co., Canada West; Died May 29, 1901, in Caldwell Twp, Ontario, Canada (age 57). Laurie Ann Watson: Born about 1848 in Ontario, Canada West; Died after 1861 in Unknown. 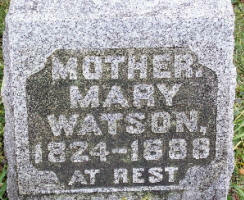 Hannah Watson: Born about 1850 in Clarke Twp., Durham Co., Canada West; Died after 1871 in Unknown. William George Watson: Born born November 14, 1858, in Port Hope, Durham Co., Ontario, Canada West; Died August 10, 1950, in Flint, Genesee Co., MI (age 91). Buried in Evergreen Cemetery (a/k/a Whigville Cemetery), Grand Blanc, Genesee Co., MI. 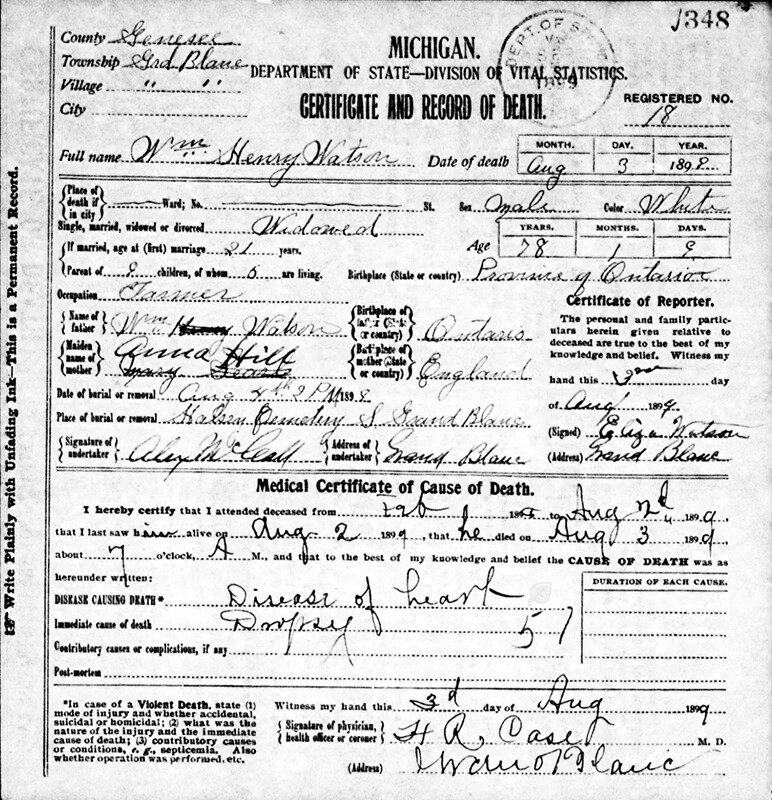 Married July 9, 1884, in Grand Blanc, Genesee Co., MI, to Ida Lewis: Born June 7, 1866, in Michigan; Died August 2, 1911, in Grand Blanc, Genesee Co., MI (age 45). Buried in Evergreen Cemetery (a/k/a Whigville Cemetery), Grand Blanc, Genesee Co., MI. Elizabeth Jane Watson: Born August 9, 1861, in Harwich Twp., Kent Co., Ontario, Canada West; Died August 13, 1915, in Grand Blanc Twp., Genesee Co., MI (age 54). Buried in Evergreen Cemetery (a/k/a Whigville Cemetery), Grand Blanc, Genesee Co., MI. Married about 1877 in Ontario, Canada to John Frank Watson: Born about 1844 in Canada West; Died Unknown. William Henry Watson and Mary (Searle) Watson are buried in South Grand Blanc Cemetery (a/k/a Halsey Cemetery), Grand Blanc, Genesee Co., MI. Thanks to Find-A-Grave for making these images available. William Henry Watson was born 1821 in Upper Canada. Mary Searle was born about July 14, 1823, in County Cornwall, England. William Watson and Mary Searle were married October 24, 1846, in Hope Twp., Durham Co., Canada West, by Rev. John Cassie. "William WATSON, to Mary LORD or FORD (SOUL), both of Hope, 24 Oct. 1846. Rev. CASSIE. Wit. Elisabeth Phebe LORD or FORD (SOUL) and T'hos HARNESS". This is most likely Phoebe Elizabeth Searle, the sister of Mary Searle. When Phoebe got married, her sister Catherine Searle was a witness. William Henry Watson and Mary Searle Marriage Record. 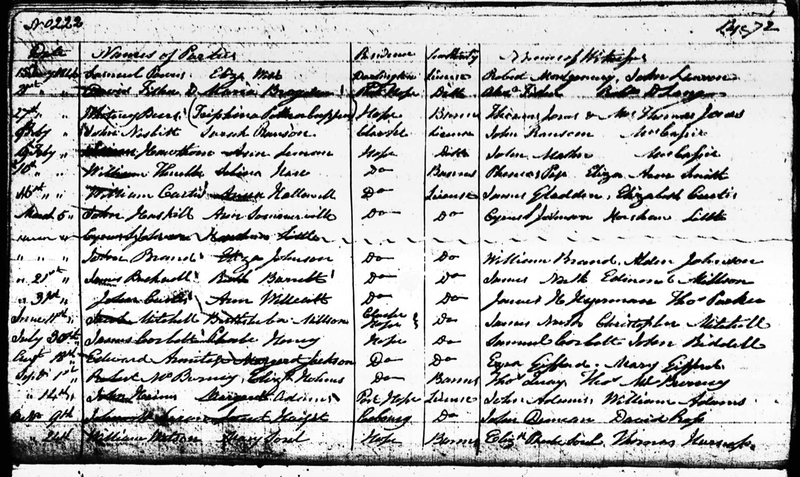 The 1851 Canadian Census shows William Watson (age 26) born in Canada, and with Catholic religion is a Labourer, and is living in a Frame Home in Hope Twp., Durham Co., Canada West. Living with him are: Mary Watson (age 26) born in England, and affiliated with the Church of England religion; Franklin Watson (age 4) born in Canada; Laury Ann Watson (age 3) born in Canada; and Hannah Watson (age 1) born in Canada. Leigh Larson note: The Charles Abbey family lives in a Shanty a few homes away, including Elizabeth (Searle) Abbey, the sister of Mary (Searle) Watson, Allice Sarl (age 17) unmarried, and George Sarl (age 1). Allice is likely the daughter of William Searle and George is the son of Alice Searle. 1861 Canadian Census shows William Watson (age 37) born in Ontario, and with W. M. religion, is a Farmer, and lives in a Shanty, and is living in Clarke Twp., Durham Co., Canada West. 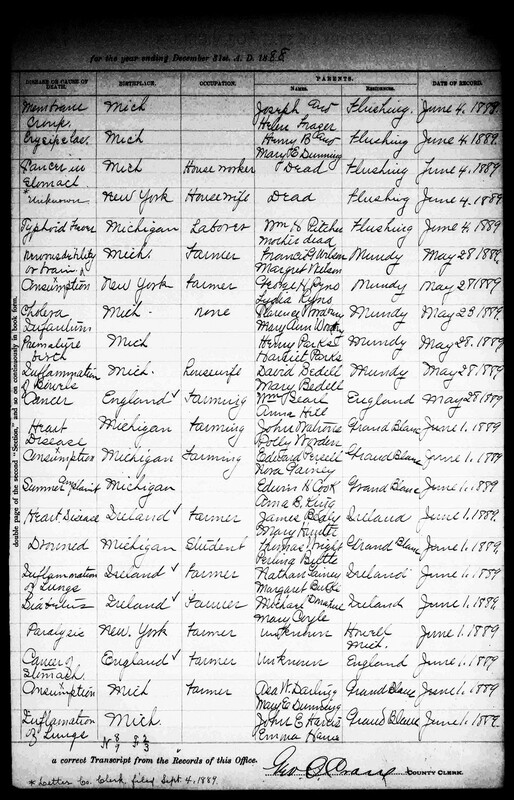 Living with him are: Mary Watson (age 38) born in England, and with W. Methodist religion; Franklin Watson (age 13) born in Ontario, a Labourer; Hanah Watson (age 6) born in Ontario; Ann Watson (age 6) born in Ontario; William Watson (age 4) born in Ontario; and Eliza Watson (age 1, birth in 1860) born in Ontario. 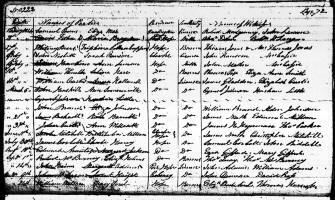 The 1871 Canadian Census shows William Watson (age 46) born in Ontario, and with Universalist religion, is a Farmer, and is living in Harwich Twp., Kent Co., Canada West. Living with him are: Mary Watson (age 47) born in England and with W. Methodist religion; Franklin Watson (age 23) born in Ontario, a Laborer; Hannah Watson (age 17) born in Ontario; Emily Watson (age 15) born in Ontario; William G. Watson (age 13) born in Ontario; and Eliza J. Watson (age 10) born in Ontario. The William Henry Watson family moved to Michigan about 1880. Mary (Searle) Watson died August 26, 1888, in Grand Blanc, Genesee Co., MI, at age 64 years, 7 months, and 30 days, according to the death certificate. Buried in Halsey Cemetery, South Grand Blanc, Grand Blanc Co., MI. Mary (Searle) Watson Death Record. The cause of death was Cancer. She was born in England, with parents Wm. Searl and Anna Hill. 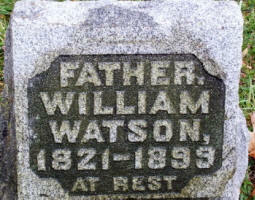 William Henry Watson died August 3, 1899, in Grand Blanc Twp., Genesee Co., MI, at about age 78. Buried in Halsey Cemetery, South Grand Blanc, Grand Blanc Co., MI. 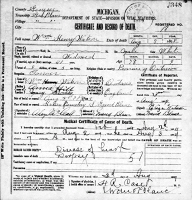 William Henry Watson Death Record. The cause of death was Heart Disease. He was born in Ontario, Canada. The named parents are incorrect. The 1901 Canadian Census shows Frank Watson, Electa Watson, Albert Delong and others living near each other in Caldwell, Nipissing Co., Ontario, Canada. The 1901 Canadian Census shows Frank Watson (age 48) born March 18, 1853, in Michigan, USA, and having emigrated in 1875 is Working in a Saw Mill and living in Caldwell Twp., Nipissing Co., Ontario, Canada. Living with him is his wife, Electa Watson (age 52) born July 13, 1848 in Ontario, Canada. Also living there are his two unmarried sons, both born in Ontario, Canada: Willie Watson (age 19) born November 12, 1881; and Thom Watson (age 16) born October 13, 1884. The 1910 U. S. Census dated May 2, 1910, shows Wyman Watson (age 31) born in English Canada to English Canadian-born parents and in his first marriage, and having immigrated in 1880 with Pa citizenship, is a married Blacksmith of his Own Shop who owns his home free of a mortgage and is living in Grand Blanc Twp., Genesee Co., MI. Living with him is his wife of 2 years, Lottie J. Watson (age 32) born in Michigan to Michigan-born parents and in her second marriage, with the only child born to her still alive. Also living there are: his daughter, Bernice M. Watson (age 11/12) born in Michigan to English Canadian and Michigan-born parents; and his unmarried mother, Eliza J. Watson (age 48) born in English Canada to English Canadian-born parents, and having immigrated in 1880. The 1911 Canadian Census shows Albert Delong (age 46) born May 1865 in Ontario, Canada, is a Farmer in the County Mills and is living in Lot 29, Concession 14, Cardwell, Muskoka, Ontario, Canada. Living with him is his wife, Sarah Delong (age 39) born February 1872 in Ontario, Canada. Also living there are his eight unmarried children: Edna R. Delong (age 17) born February 1894 in Ontario, Canada; Wilfred R. Delong (age 18) born 16) born August 1895 in Ontario,, Canada, a Farmer's Son; Ada M. Delong (age 14) born March 1897 in Ontario, Canada; Thomas A. Delong (age 11) born July 1900 in U.S.A. and having emigrated in 1901 and a Naturalized citizen; Olive J. Delong (age 8) born August 1902 in Ontario, Canada; Elmer Delong (age 7) born March 1904 in Ontario, Canada; Electa M. Delong (age 2) born June 1908 in Ontario, Canada; and Clarence R. Delong (age 8/12) born July 1910 in Ontario, Canada. 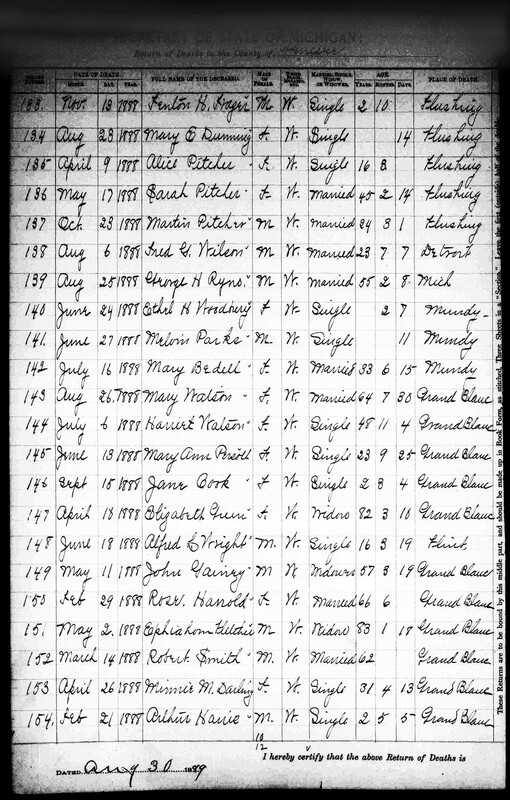 The 1911 Canadian Census shows Albert Delong (age 46) born May 1865 in Ontario, Canada, is a Farmer in the County Mills and is living in Lot 29, Concession 14, Cardwell, Muskoka, Ontario, Canada. Living with him is his wife, Sarah Delong (age 39) born February 1872 in Ontario, Canada. Also living there are his eight unmarried children: Edna R. Delong (age 17) born February 1894 in Ontario, Canada; Wilfred R. Delong (age 18) born 16) born August 1895 in Ontario, Canada, a Farmer's Son; Ada M. Delong (age 14) born March 1897 in Ontario, Canada; Thomas A. Delong (age 11) born July 1900 in U.S.A. and having emigrated in 1901 and a Naturalized citizen; Olive J. Delong (age 8) born August 1902 in Ontario, Canada; Elmer Delong (age 7) born March 1904 in Ontario, Canada; Electa M. Delong (age 2) born June 1908 in Ontario, Canada; and Clarence R. Delong (age 8/12) born July 1910 in Ontario, Canada.